Packed full of features and functions, the freestanding Bosch WAP24390GB will take the hassle out of doing the laundry. 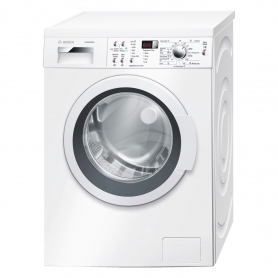 This fantastic washing machine is also exclusive to Euronics and Agents stores, so you won’t find it anywhere else. Laundry is one of those things you know you have to do, but life often gets in the way. Luckily, the WAP24390P comes with VarioPerfect technology, allowing you to fit the laundry around your life, and not the other way around. VarioPerfect allows you to reduce programme time by up to 65%, or energy consumption by up to 50% at the touch of a button, and with no compromise in performance. Select Speed Perfect and wash a full-load in under an hour, or choose Eco Perfect and save money on your bills. This energy saving option, as well as other features, mean the Bosch WAP24390GB has an energy efficiency rating of A+++ -30%. This means it uses almost a third less energy than a standard A+++ machine. The Active Water feature gets the most out of every single drop of water, ensuring maximum efficiency with every load, while the revolutionary EcoSilence drive achieves maximum power with minimum energy loss. 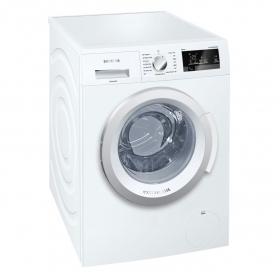 With 15 programmes ranging from Sportswear to Delicates, and a 1200 rpm spin speed, the WAP24390GB ensures great washing results, no matter what the load may be. Cotton is the most commonly used natural fibre in the world, and the majority of your clothing will have a cotton mix, if not be completely made from it. With this in mind, Bosch has made it easy to select from six different cotton wash programmes. The different programmes allow you to quickly pick the desired temperature for your load without having to adjust any other settings. In a rush and need a couple of shirts or an outfit clean in a hurry? Select SuperQuick 15 and you will have clean clothes in just 15 minutes. In addition to the large range of programmes, there are also options that customise each wash. Press the Aqua Plus button and a higher water level is used during the wash and rinse cycles, ensuring maximum detergent removal – ideal for those with sensitive skin. The Reduced Ironing function adds a gentler spin during the programme and at the end of the spin cycle to reduce creasing. The WAP24390GB has some additional features that help make doing the laundry that little bit easier. The self-cleaning detergent drawer has smooth walls and jet sprays in each corner to automatically flush away any lingering detergent during each wash.
Make the most of night-time energy rates or have the washing ready for when you get home from work with the 24-hour time delay. Simply load the washing machine as normal, and then select how many hours you want to delay the start of the cycle by. You also won’t have to worry about wandering fingers disrupting the cycle, as this Bosch washing machine comes with its own child lock. Dropped a sock on your way to the washing machine? No problem! The reload function allows you to add to the wash, even once the cycle has started. The large 8 kg capacity, great range of programmes and energy saving features make the WAP24390GB perfect for any household. Order yours today, in a modern white finish with stylish chrome details.